"World of Krypton": Part Four - "Eradication"
Lois Lane is mortally wounded. She has been thrown through glass and landed on a rooftop. Building security race to her but Superman halts them and tends to his dying friend. Somehow Lois is aware of everything going on. Lois' mind wanders back to a night when she was alone in the Daily Planet PGN offices. Video conferencing, or trying to at least, with her boyfriend Jonathan Carroll who is on assignment overseas. Poor signal and a call from Clark put an end to it and Lois probes her friend for the lead on a story, she also jibes him a little on clarkcatropolis.com and his career from award winning journalist to... unpaid blogger. She however wishes him nothing but the best even if she thinks it will kill his career. From out of the shadows a young woman appears and asks Lois for help but despite Lois' attempt to comfort and probe her mysterious visitor she is hit by a psionic backlash and recovers only to find the young woman dying but physically deformed with a giant cranium. The woman explains she tried to resist the call to arms from another female but failed and Lois is the only one who can help. Lois takes the poor girls body to S.T.A.R Labs where they can run tests and ushers a hovering Superman to be even faster at an autopsy with his microscopic vision. Clark explains that the girl is damaged on a cellular level, but the damage, psionic in nature was self inflicted. Lois sneaks away the girl's belongings and heads back to PGN where she locates the girl's car in the parking garage. Finding the driver's license Lois is shocked to find her identity is Amelia Darling... One of twenty people that vanished five years ago. Lois thinks back to Superman's rescue of Metropolis when Brainiac was trying to steal the city and to Lex Luthor's chagrin he succeeded. In the aftermath Lois began investigating twenty people, from completely different walks of life that seemingly all vanished on that same day. None of them ever came back, all their trails ran cold until today and Amelia Darling's sudden reappearance. Reopening her own cold case Lois began looking into Amelia. A reliable barmaid that was punctual and with a loving family that just went away one day. Lois hopes a fresh perspective will provide more clues and regrets not drafting in Clark to the story but Amelia approached her specifically so this was now a personal case. Opening old wounds with surviving families was hard for Lois but her desire for the truth strengthened her resolve and she persevered. She found that of the twenty, five had passed away but all seemed to have some kind of mental power to mask their time away in the five years past. At Amelia's funeral Lois watches the surroundings searching for another lead before it goes cold again and she spots a man hiding in the shadows and pouring rain. As she approaches a psionic attack like the one before knocks Lois off her feet. A soldier, Sung Lee appears, one of the twenty that vanished. He tells here the twenty are being hunted by someone and that she should stay out of it or she might share their fate. Lois refuses to back down demanding the truth. Sung reveals his expanded cranium just like Amelia's which he has kept hiding with mental blocking. He reveals that he, like the others, had tried to resist but the mystery female wouldn't let them. Lois sees Sung readying to leave and begs him to stay so they can find a cure for the remaining victims. As Sung vanishes from sight he offers only one clue, "Senator Hume." At a fundraiser, Lois notes that Hume was the one senator that was vehemently anti-Superman and spearheaded the campaign to investigate the Fortress of Solitude. Lois wonders if there's a link as this all goes back to the day of the attack. When Lois spots Hume she brushes off Clark's chit chat and makes a beeline for Hume. Clark watches suspiciously as Lois is ushered away from the crowd into a private room. Hume is relieved that Lois knows much of the case and she demands to know how they were still amongst people but were 'invisible' to those that had searched. Hume explains all he did was for the upcoming event, the best for all of us. He explains that he was a poor tramp pushing a shopping cart through the streets when Superman fought Brainiac. It turns out while distracting Superman miles above, Brainiac had entered the bottled city psionically and sought out twenty people to 'gift' as potential hosts for his cause. Lois is shocked as she learns of Vril Dox and his quest to halt the Multitude, he shrank hundreds of cities across the galaxy in a hope to restore his planet, Colu's inhabitants. The mental stability of the populace of past cities hadn't worked, they had inferior capacity to 'rehouse' the Coluan minds so when Brainiac arrived and attempted to steal Metropolis he found some of them a close match. Brainiac elevated the twenty to 12th level intellect and they all instantly recognized one another with a psionic bond. They began using their powers for fun, profit or like Hume, for career. The storytelling stops there as Hume begins to weaken from telepathically telling the story to Lois and like Sung Lee and Amelia Darling, Hume's head expands and glows green. 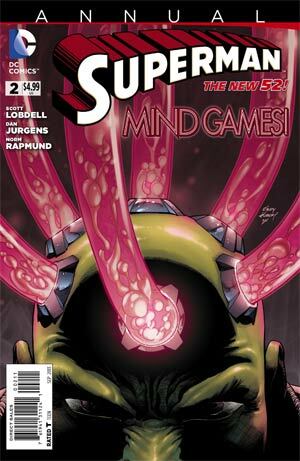 He asks Lois to reveal Brainiac is hunting for them, that he will return. Lois agrees but Hume doesn't want to take the chance her story might be buried so he infects Lois, transferring his power to her. The force of the transfer blows Lois out of the office window and we return to the present, with Lois now one of the twenty, her only fate, even with Superman's help - is death. To Be Continued... In Action Comics and Superman "Psi War". Story - 5: A brilliant follow up to the Multitude story, even if I don't really buy into Vril Dox fitting into it and him secretly 'gifting' twenty people while his robotic self fought Superman. The foreshadowing with Hume now makes sense a bit more than him just being vindictive to Superman. Lobdell deserves credit for the effort to span the five years and make it relevant to a story years later. This investigation actually works really well. I enjoyed finally getting a Lois Lane story, the first proper one since the New 52 began. Art - 5: The art was nothing short of brilliant. I can't put my finger on why it looks so good here compared to the arc with the Russian predator story, perhaps it is because Superman has had a bit more time to flesh out a little. Lois looks great and the art really leapt off the pages despite there being no massive action sequences to 'pop' with. Cover Art - 2: Not exactly an awe inspiring cover and though it reveals the return of one of Superman's deadliest rogues it really is a bit bland and ill fitting with the above average story inside. The colonel has revealed allegiance to the cult group Eradicator. Having stolen the Harmonic Resonator he intends to use it to destroy his enemies. This leads to devastation of Krypton's cities. Kra-Hu leads Jor-El and Lara below the surface into an elevator, he warns the duo that he can't block those that are tracking them for long. Lara asks about the resonator and Jor explains that the resonator was being used by the colonel to influence minds and gather support for his cause. Those that would usually have been against the cult find themselves oddly drawn to help it. Kra-Hu explains that the colonel's plan is to set Kryptonians onto each other so they destroy themselves. As the lift comes to a halt they are greeted by a group of soldiers. Jor emits an electrical charge from his gauntlets that knocks them back but they are armed too and stun Jor to his knees and drag him to the colonel. Jax takes Lara aside and assures her he can protect her by lying that she helped bring in Jor for their cause. Lara is angry at being accused of being a common criminal that needs his assistance, especially as Jax knows what the resonator is planned for. Jax reveals that Jor was the man that invented the resonator to begin with. If not for Jor and the resonator's manipulation of the populace already they wouldn't be in this predicament. Krypton bred clones for spare parts and servitude for years regardless of their right to life, the loss of life over years amounted to billions dead. With the resonator's influence the colonel hopes to reset the minds of the populace and bend them to the Eradicator cult's cause. And with that explained the colonel activates the resonator. Story - 3: Perhaps spoiled by the story on Superman #0, I am not really keen on this story as I could have been if not for that. As it is a back up it also seems too constricted and rushed. Perhaps all together it would be a better read. Art - 3: Again suffering from the format of back up the art seems equally strangulated into the space. Had it been allowed to breath I think Derenick could have really gone to town with it.